The island of Dominica is not the only island in the Caribbean to have sulphur springs in the form of hot springs. We have our own here in Grenada. To the north of Grand Etang, just outside of Grenville are several hot springs. The easiest to reach are Clabony Hot Springs. The route to the springs can be a little complicated, so it’s advised that you take a guide with you. It’s easy to branch off in the wrong direction. 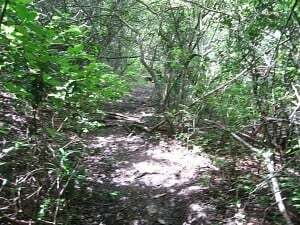 The approach is through banana and nutmeg plantations so a 4×4 comes in handy too to reach the point from where you can walk to the springs. A short walk over gurgling streams and over rocks will lead to a rock pool. The waist high water is a pleasant temperature, but if there is a lot of rain it can often be cooler than hoped for. The water is clear until you move your feet. The pools are to the north of Grand Etang and a visit to them could be combined with a hike in Grand Etang in the morning. After a good walk, the hot springs could be a relaxing stop off before returning to the hotel for a shower and dinner. Alternatively, there is a nutmeg processing plantation at Gouyave which can be visited without booking. Just turn up and see how nutmegs are prepared to be shipped globally. If you need us to book you any tours or a guide, please just let us know when you book your stay with us.